So if an exterior drainage system is not the answer, what is? An interior water drainage system! By installing a drainage system around the inside of the basement along the wall, you can capture water at the most common point of entry - the floor/wall joint. You can also capture water from the walls and prevent the center of the basement floor from leaking by intercepting the water at the perimeter of the floor before it gets to the center. Accessibility to do the job. More affordable than an outside system. Installs in a day or two. Even in basements that are already finished, it's still much easier to waterproof from the inside than the outside. Most full-time basement waterproofing companies offer interior drainage systems - between which there are big differences in systems. 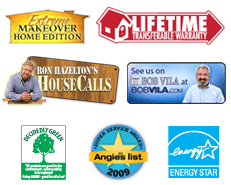 Some are old-fashioned and generic, and others are modern and specially designed for the job. 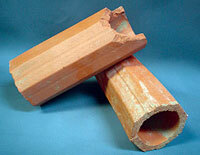 In the 1950's and before, clay pipe sections about 18 inches long were used for underground and under-floor drains. There were no holes in the pipe, but instead the sections were laid with a quarter-inch space between them to let in water. Since the pipe sections were made from clay tile material - like a chimney flue pipe or a brick- they called it drain "tile." This term, drain tile, is still used today to refer to a pipe with holes or slots in it that is buried for drainage, even though the industry switched to plastic pipe long ago. These generic, round, perforated drainpipes can be used for field drainage, exterior footing drains, road drainage, and just about anything. Clay or plastic, the pipe was usually laid alongside the footing in new construction applications, and many contractors do the same for retrofitting an existing home. However, this placement of the pipe isn't necessarily the best. Existing drains alongside the footing have failed - usually by clogging with dirt. Slowly, different methods began to develop in the 60's, and afterwards. Today, a system called WaterGuard®, developed in 1994, has proven to have all the benefits for which homeowners and contractors are looking. In some cases, such as in basements where there is no footing (i.e. ; monolithic basement floors), a system called DryTrak®, which is a baseboard water drainage system, may be installed. All Basement Systems dealers install the most appropriate drainage system for your basement. Contact your local waterproofing contractor today by calling 1-800-638-7048 or online for a free estimate and inspection.